Dear Believer, Why Does God Only Help You? As a preacher/missionary/believer you promise that your God will answer my prayers. You assure me that is why you believe. Because God answered your prayers, you promise that your God will help me in my times of need as well. It’s for that reason you tell me I should believe the same as you do. As a natural preacher and a person that devoted two years to a mission for my own faith I think I know where you are coming from. When you are talking about your experiences and how you see the world it feels good. It feels emotionally satisfying. You ‘feel the spirit’ when you share your own experiences and ideas about God. When you are talk to another person and they emotionally respond to your testimony it like gas on fire and multiplies what you feel many, many fold. If you study religious practices you’ll find it’s a common practice that communal beliefs are reinforced by sharing them. Muslims have their group prayer, Christians their healing sessions, Mormons have testimony meetings, Catholics commune, Pentecostals dance and sing being consumed by the spirit. In all these cases the common thread is an act, an outward physical expression of their belief and a sympathetic response from their community. Invariably you leave such a meeting uplifted, filled with an experience that confirms your faith is the ‘right one.’ Feeling a desire to share it more. Willing to enter the realm of the heathen to share this gospel that gives you so much joy. I wonder though if deep down you realize you are envisioning a world that you hope for but don’t see. One where all wrongs are righted, things are fair and good people don’t suffer. Maybe that’s why you bristle when asked for evidence or are shown information that shakes your faith. Maybe deep down you know it’s all an illusion created and sustained via a community willing to reinforce that belief. A community in which each individual is on just as shaky ground internally while they too publicly profess confident belief in what their heart desires. Hmmm… maybe the reason I preach the kindness of the Fridge is in an effort to capture that same sense of oneness among my new community of heathens and apostates. Maybe I think my goal of faith in the improbable is one where religions no longer impose tribalism and hypocrisy on their followers. Maybe my insane hope that humanity will be able to just get along is shared by others no matter how crazy it sounds. Even now as I write this that familiar feeling in my chest swells, burning with confirmation. A feeling that in the past I invariably took as a sign God was telling me I was on the right path. The inward realization of an outpouring of love by community, friends and family. A hope of shared purpose and common ideals. When I see some bit of wisdom from the Fridge shared on Facebook or Reddit, it warms my heart. When I see that hundreds of thousands of times these words have been read and touched someone’s life it makes me feel good. In short, as a heathen and lost soul by definition of my previous faith I still feel the same spirit and passion in a totally new, albeit completely fake one. In this new world I have met many people who didn’t have such a positive experience in religion as I did. One such was abused as a little girl, raped and beaten by priesthood holders as she prayed with the faith of a 7 year old to be saved. She told church leaders of her plight and they ignored her pleas for help instead thinking their power of discernment worked because they believed the adult perpetrator over her. Her prayers went unanswered, yet for those that have felt an answer it’s as if they can’t believe she had been ignored. I have seen church members preach to her about how if only she’d have faith their God would come through. Thier God would make it all better because thier God fixes everything… For them. Why is it your God is always there for you? Why is it your God lets others down but still answers your prayers? Are you special? Do you deserve help finding keys or paying the rent while a little girl is left on her own pleading to not be raped and beaten? Can you feel the spirit of the Fridge right now, pricking your heart, signaling a deep truth is about to unfold? I have hope that you might realize your God was you all along. You helped you and the moment you realize that you will realize that you helping others is exactly how your God helps others. It’s not by preaching about your better belief. It’s not by converting others to your faith. 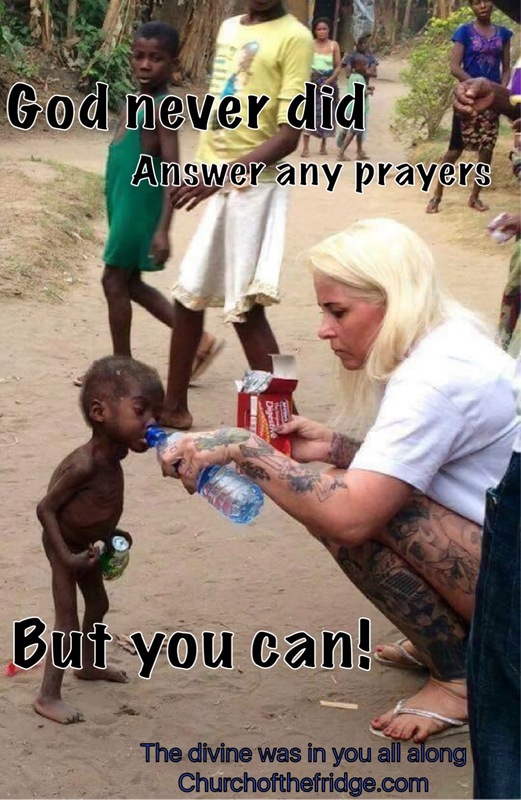 Do you want to prove your God helps others and doesn’t ignore their prayers? I’d suggest hold out your hand to help. The Fridge would say; Bend your ear in sympathy to another’s plight. Be there for your fellow being. Don’t take the lazy way out by sending a prayer begging someone else to do what needs to be done. Reach for the improbable, hope for the impossible and do something. The Fridge helps those that help themselves. Those that bless others will be blessed in return. Next Post Mormon… And Gay?